The golliwog, golliwogg or golly is a fictional character created by Florence Kate Upton that appears in children's books in the late 19th century and usually depicted as a type of rag doll. It was reproduced, both by commercial and hobby toy-makers as a children's toy called the "golliwog", and had great popularity in the UK and Australia into the 1970s. The doll is characterised by black skin, eyes rimmed in white, red lips and frizzy hair. Though home-made golliwogs were sometimes female, the golliwog was generally male. For this reason, in the period following World War II, the golliwog was seen, along with the teddy bear, as a suitable soft toy for a young boy. The image of the doll has become the subject of controversy. Whilst some people see the doll as an innocuous toy, its is considered as racist, along with pickaninnies, minstrels, mammy figures, and other caricatures of black Africans. 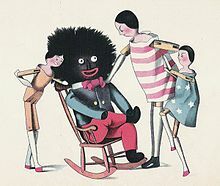 The golliwog has been described by the Jim Crow Museum of Racist Memorabilia as "the least known of the major anti-Black caricatures in the United States". In recent years, changing political attitudes with regard to race have reduced the popularity and sales of golliwogs as toys. Manufacturers who have used golliwogs as a motif (e.g. Robertson's Marmalade in the UK) have either withdrawn them as an icon, or changed the name. In particular, the association of the golliwog with the pejorative term "wog" has resulted in use of alternative names such as "golly" and "golly doll". Florence Kate Upton was born in 1873 in Flushing, New York, United States, the daughter of English parents who had emigrated to the United States three years previously. Following the death of her father, she moved back to England with her mother and sisters when she was fourteen. There she spent several years drawing and developing her artistic skills. To afford tuition to art school, she illustrated a children's book entitled The Adventures of Two Dutch Dolls and a Golliwogg. 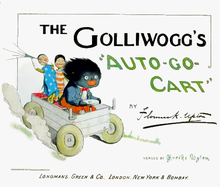 The 1895 book included a character named the Golliwogg, who was first described as "a horrid sight, the blackest gnome", but who quickly turned out to be a friendly character, and is later attributed with a "kind face." 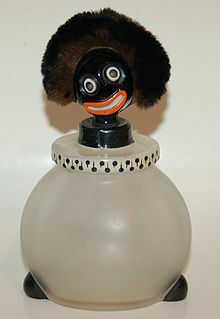 A product of the blackface minstrel tradition, the Golliwogg had jet black skin; bright red lips; and wild woolly hair. He wore red trousers, a shirt with a stiff collar, red bow-tie, and a blue jacket with tails – all traditional minstrel attire. Upton's book and its many sequels were extremely successful in England, largely because of the popularity of the Golliwogg. Upton did not trademark her character, and its name, spelt "golliwog", became the generic name for dolls and images of a similar type. The golliwog doll became a popular children's toy throughout most of the 20th century, and was incorporated into many aspects of British commerce and culture; for instance, some of Enid Blyton's books feature them, often as a villain and sometimes as heroes. Upton's Golliwogg was jovial, friendly and gallant, but some later golliwogs were sinister or menacing characters. The golliwog contributed enormously to the spread of blackface iconography in Europe. It also made its way back across the Atlantic in the form of children's literature, dolls, children's china and other toys, ladies' perfume, and jewellery. Golliwogg's Cakewalk is the sixth and final piece in the Children's Corner, a suite for piano published by Claude Debussy in 1908. British jam manufacturer James Robertson & Sons used a golliwog called Golly as its mascot from 1910, after John Robertson apparently saw children playing with golliwog dolls in the United States. Robertson's started producing promotional Golly badges in the 1920s, which could be obtained in exchange for tokens gained from their products. In 1983, the company's products were boycotted by the Greater London Council as offensive, and in 1988 the character ceased to be used in television advertising. The company used to give away golliwog badges and small plaster figures playing musical instruments (jazz musicians) or sports and other such themes. The Gollywog badge collection scheme was withdrawn in 2001. According to an editorial in The Times newspaper, golliwogs were banned by the Nazis in 1934 on the grounds they were inappropriate toys for young German children, "for of all non-Aryans none is more completely non-Aryan than he [Golliwog]... Some say he is so attractive an advertisement for a black face that his presence makes it harder to teach the young to wash."
In a statement reported by the BBC, Virginia (Ginny) C. Knox, previously brand director for Robertson's and later Chief Operating Officer of the Culinary Brands Division of RHM, told The Herald newspaper in Scotland in 2001 that the decision to remove the Golly symbol from Robertson's jam and marmalade jars was taken after research found that children were not familiar with the character, although it still appealed to the older generations. "We sell 45 million jars of jam and marmalade each year and they have pretty much all got Golly on them," said Ms Knox. "We also sell 250,000 Golly badges to collectors and only get 10 letters a year from people who don't like the Golliwog image." Today, Robertson's Golly badges remain highly collectible, with the very rarest sometimes selling for more than £1,000. An aniseed-flavoured chewy confection called a Blackjack was marketed in the United Kingdom from the 1920s with a golliwog's face on the wrapper. In the late 1980s, Trebor, the manufacturer, replaced the image with the face of a black-bearded pirate. Art historian Sir Kenneth Clark said that the golliwogs of his childhood were "examples of chivalry, far more persuasive than the unconvincing Knights of the Arthurian legend." A classic contortionist act is the rag doll act often performed in a golliwog costume, therefore also called the golliwogg act. In The League of Extraordinary Gentlemen: Black Dossier and Volume III: Century, Alan Moore and Kevin O'Neill included Upton's original Golliwog with a slightly reimagined, alien past. When this was attacked as a racist character, Moore responded that the Upton's original Golliwog "was a dignified and respectable figure. His courage and strength of character were ably demonstrated in his picaresque adventures, as was his intellectual acumen." In March 2007, Greater Manchester Police seized two golliwogs from a shop after a complaint that the dolls were offensive. In September 2008, a woman from Stockport claimed she was arrested for keeping a "golly doll" in her window. Greater Manchester Police denied this and said she was arrested after a series of complaints of alleged racially aggravated behaviour were made against her. In February 2009, Carol Thatcher, daughter of Margaret Thatcher, former British Prime Minister, in an off-air conversation at the BBC, referred to the black French tennis player Jo-Wilfried Tsonga, competing in the Australian Open, as looking like a golliwog. The comment was considered by the BBC as "wholly unacceptable" and Thatcher was informed that unless she apologised she would no longer be a reporter on BBC's The One Show. Thatcher stated that it was a silly joke and declined to make an "unconditional apology". Thatcher claimed that her comment was a reference to the golliwog motifs that she saw in her childhood on jars of jam (made by Robertson's). In April 2009 she appeared on the BBC in an interview on The Andrew Marr Show for the first time since the scandal, defending her use of the word. The French publication Sportsweek claimed that Thatcher, in talking about a previous competition, referred to another player as "the one who was defeated by the golliwog in the previous tour." The French publication, which showed a picture of Tsonga above a picture of a toy golliwog, claimed that Thatcher was "mortified" and that her comment was about the similarity of Tsonga's appearance to the doll that she had as a child. In March 2011, two prospective Conservative local councillors resigned from the party after their membership was suspended following complaints from fellow party members that they had used images of golliwogs as part of a protest against political correctness. Bill and Star Etheridge, a married couple from the West Midlands who were due to stand in council elections for the Dudley borough, criticised the Conservative Party for going back on a pre-election pledge to curb political correctness, and felt that the action taken against them was "stifling" the right to free speech. They then defected to the UK Independence Party. Bill Etheridge was elected to the European Parliament in 2014 as a UKIP candidate. In December 2013, a councillor in Brighton, was forced to apologise for stating to a newspaper reporter that golliwogs were not racist. Cllr Dawn Barnett was defending a local shop which was selling golliwog drinks mats. In her opinion, "I said I can see no harm in them. They are nostalgic, I'm 72 years old. My generation grew up with them." Bert Williams, speaking on behalf of Brighton and Hove Black History Group, said the word "golliwog" was historically used to tease black people, of which he had personal experience. In April 2018, a man was fined £250 plus £85 costs for displaying a golliwog in a window opposite two Indian restaurants. He pleaded guilty to "displaying it with intent to cause harassment, alarm or distress and that the offence was racially aggravated." In July 2018, a YouGov poll was set up that asked 1,660 Britons whether it was "racist to sell or display a golliwog doll", to which a 63% responded "No", 20% "Yes", and 17% "I'm Not Sure". In December 2013, in Toowoomba, Australia, Darrell Lea Chocolate Shop made no comment when customers complained about their sale of golliwogs. On 1 December 2016, Australian Aboriginal activist, author and filmmaker Dr Stephen Hagan caused a national controversy when he labelled Toowoomba the "most racist city in Australia" after a display of nine golliwog dolls were placed by Terry White Chemists underneath a sign inviting shoppers to "Experience a White Christmas" (referring to the name Terry White Chemists). The controversy began when Toowoomba man George Helon spotted the dolls unfortunately placed beneath the sign and circulated a picture of it on Facebook and Twitter. The display was only in one store, as a franchisee can "stock and sell products at their discretion", however Terry White Chemists banned the sale of the doll in any franchise afterwards. ^ a b Lam, Charlotte (2 December 2016). "'Golliwog' collector slams decision to pull doll". Central Telegraph. ^ a b c Pilgrim, David (2000). "The Golliwog Caricature". Ferris State University. Retrieved 23 October 2018. ^ Billings, Claire (23 August 2001). "Robertson's axes Golly after 91 years". Campaign. Retrieved 23 October 2018. ^ "Title unknown". The Times. 16 March 1934. p. 15. ^ "'Controversial' golly to be shelved". BBC News. 23 August 2001. Retrieved 23 October 2018. ^ "Golly dolls seized by cops". Manchester Evening News. 15 March 2007. Retrieved 18 March 2010. ^ "Woman arrested over 'golly' doll". Manchester Evening News. 19 April 2010. Retrieved 23 October 2018. ^ Singh, Anita (4 February 2009). "Carol Thatcher 'golliwog' jibe referred to black tennis player Jo-Wilfried Tsonga". Daily Telegraph. Retrieved 23 October 2018. ^ Moore-Bridger, Benedict (6 February 2009). "Boris backs Thatcher over golliwog sacking". London Evening Standard. Archived from the original on 6 June 2011. Retrieved 23 October 2018. ^ "Thatcher axed by BBC's One Show". BBC News. 4 February 2009. Retrieved 23 October 2018. ^ "Unrepentant Thatcher back on BBC". BBC News. 19 April 2009. Retrieved 23 October 2018. ^ Beaudouin, Aurélie (4 February 2009). "Jo-Wilfried Tsonga insulté par la fille de Margaret Thatcher" (in French). Sportweek.fr. Retrieved 23 October 2018. ^ Ellicott, Claire (22 March 2011). "Tory husband wife posed with golliwogs on Facebook forced leave conservatives". Daily Mail. Retrieved 23 October 2018. ^ "vote 2014 - West Midlands". BBC. Retrieved 26 May 2014. ^ "Brighton councillor rapped over golliwog comment". BBC News. 20 December 2013. Retrieved 23 October 2018. ^ "Prestatyn man fined for race-hate doll in window". BBC News. 30 April 2018. Retrieved 30 April 2018. ^ "Most British people don't think a 'golliwog', a doll that looks like a minstrel, is racist". The Independent. 2018-07-24. Retrieved 2018-10-24. ^ "Toowoomba business under fire over racist dolls". Toowoomba Chronicle. 24 December 2013. Retrieved 23 October 2018. ^ "Offensive 'white Christmas' display sparks calls for Golliwog boycott in Australia". Special_Broadcasting_Service. 1 December 2016. Retrieved 8 February 2018. ^ "Toowoomba accused by activists of being Australia's most racist city after chemist shop display". News.com.au. 2 December 2016. Retrieved 9 December 2016. ^ "Toowoomba accused by activists of being Australia's most racist city after chemist shop display". New Zealand Herald. 2 December 2016. Retrieved 9 December 2016. ^ "White Christmas 'golliwog' display labelled racist". Toowoomba Chronicle. 1 December 2016. Retrieved 9 February 2018. ^ "Queensland chemist under fire for 'racist' golliwog display". Nine News. 1 December 2016. Retrieved 9 December 2016. ^ "Offensive 'white Christmas' display sparks calls for Golliwog boycott in Australia". SBS Australia. 1 December 2016. Retrieved 9 December 2016. ^ "Toowoomba accused by activists of being Australia's most racist city after chemist shop display Offensive 'white Christmas' display sparks calls for Golliwog boycott in Australia". Courier Mail. 2 December 2016. Retrieved 9 December 2016. ^ "TERRY WHITE CHEMIST UNDER FIRE FOR GOLLIWOG DISPLAY". AJP. 1 December 2016. Retrieved 11 October 2017. Wikimedia Commons has media related to Golliwoggs. "Gollies". Victoria and Albert Museum of Childhood. Retrieved 2009-01-11. This page was last edited on 12 April 2019, at 19:50 (UTC).